Boba are small circular tapioca pearls often found in bubble tea. The more traditional types are made predominately of tapioca starch, a plant-based substance that is extremely high in carbohydrate. The small spheres come dried in large bags and are prepared by being soaked, boiled, and drained. Once cooked they take on a softer and almost slippery texture that is then added to drinks and other sweet treats. Cooked boba are pleasantly chewy texture and slightly sweet on their own and are often spiked with additional sweeteners like honey or sugar syrups. The second option is called "popping" or "bursting" boba. These are tiny, edible, liquid filled sacks of fruity, sugary syrup. These pliable pearls come packed in a watery solution and are ready to eat. They are designed to be chewed for a quick burst of juicy sweetness. Different types of boba—or tapioca pearls—provide slightly different nutrients. Traditional tapioca boba contains 63 calories per ounce with 15 grams of carbs and plenty of added preservatives and artificial colors. One ounce of bursting boba contains 25 calories, primarily from sugar (6 grams of total carbs and 5 grams of sugar). Some flavors do contain a trace amount of fruit juice as well as tapioca starch, seaweed extract, and various preservatives; both kinds have a trace amount of sodium. When you put it all together, a prepared 16 fluid ounce servings of bubble tea can easily stack up to sugary 500 calories. The carbohydrate in boba comes primarily from starch. There is less than one gram each of fiber and sugars. However, if you enjoy boba in bubble tea, there may be added sugar in the tea which will substantially increase the carbohydrate you consume. There is no fat in boba. However, many boba teas are made with milk, creamer, or other dairy products. This will increase the amount of fat in your boba tea. There is only a very small amount of protein (0.1 gram) in dried boba. Again, the milk or creamer added to many boba tea recipes will increase the amount of protein that you might consume with boba. Boba provides almost no vitamins and very few minerals. There is a very small amount of folate in boba (1.1 mcg). You'll benefit from a small amount of calcium in a single serving of boba (5.6 mg). You'll also gain a small amount of iron, manganese, magnesium, phosphorus, selenium, and potassium. But the amounts are too small to make a significant dent in your recommended daily intake. Unfortunately, boba provides very few health benefits. While the calories provide energy, you won't gain substantial health or nutrition advantages from consuming the sweet treat. Ultimately, boba is really just candy drowned in heavily sugared liquids. The tea contained in these beverages may be the only redeeming quality these high-calorie drinks can offer. Boba are most commonly served in hot and cold beverages called bubble teas, made popular in Taiwan in the 1980s. Since then, boba and bubble tea have spread to coffee shops, juice bars and restaurants around the globe. What are other names for bubble tea? Bubble tea is also known as boba tea, boba milk tea, boba juice and a variety of similar names. The colorful concoction is made from a few basic ingredients. Boba balls are tossed into brewed green or black tea that has been spiked with fruit, fruit juice and some form of added sweetener such as honey, maple syrup, or other flavored syrup. Where can I find boba and bubble tea? The most common place to find boba is at a restaurant or coffee shop, but you may also see these glossy, marble-sized balls as a topping choice at your local ice cream shop or frozen yogurt bar. The bursting boba are especially popular as a topping choice. Bubble tea baristas are trained experts but you can't control the ingredients when you buy bubble tea in a coffee or tea shoppe. However, DIY bubble tea kits and economy packs of both types of boba can be purchased online. Bursting varieties come in a wide range of colors and flavors including mango, kiwi, pomegranate, passion fruit, and strawberry. 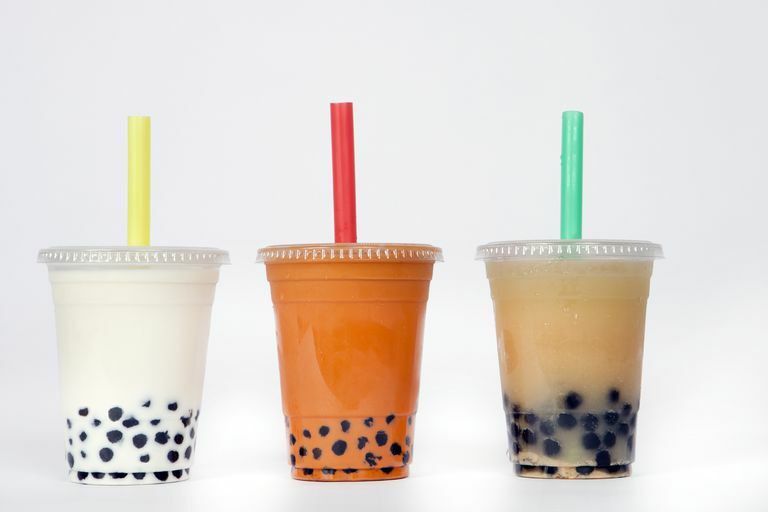 They are typically sold in 16-ounce containers for under ten dollars.You can also find tapioca boba in 8-ounce bags that cost about five dollars each. The basic tea making process is somewhat simple and there are several online videos to walk you through making homemade drinks. A homemade version does allow for better control of the quality of the ingredients and may help keep the added sugar in check. But since you can't make bubble without boba, the high-carb, low-nutrient calories are essentially unavoidable. You'll notice that when you serve boba in tea, the pearls settle to the bottom of the drink like a pile of marbles peeking through the liquid—an obvious visual cue that it is bubble tea. In some cases, milk or ​nondairy beverages like soy, almond or coconut milk are added along with a hefty dose of syrupy flavorings. Some versions include a frosty blended element making for a milkshake-like drink. Some recipes call for whole food ingredients like avocado, carrot, berries, or banana. A must-have accessory for bubble tea is a wide gauge straw, used to ensure you can slurp up the boba as you sip away. Since tapioca is made from cassava, you should avoid boba if you are allergic to the starchy root vegetable. There are also reports of people with latex allergies experiencing reactions to cassava. Ibero M, Castillo MJ, Pineda F. Allergy to cassava: a new allergenic food with cross-reactivity to latex. J Investig Allergol Clin Immunol. 2007;17(6):409-12.